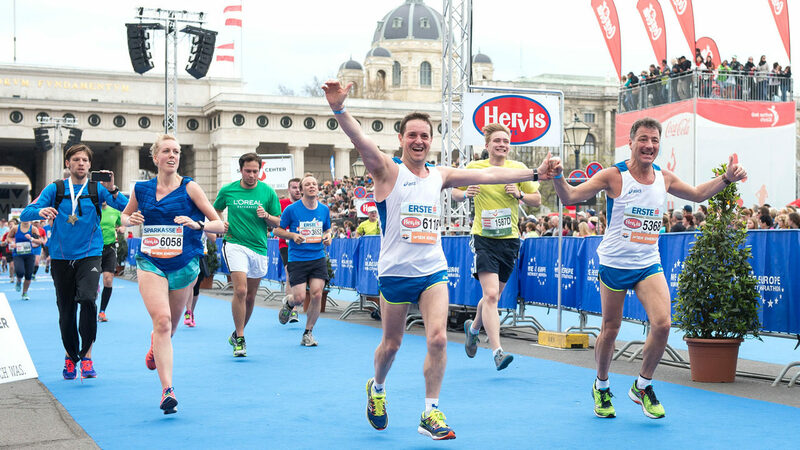 The Vienna City Marathon takes you to Vienna's most impressive modern and historic sights. It begins between the skyscrapers of the UNO complex, the site of the United Nations. Straight after the start, participants cross the 864 metre long Imperial Bridge (Reichsbrücke) over the beautiful blue waters of the River Danube, accompanied by the world famous melody of the Danube Waltz by Johann Strauß. The race takes you past the Riesenrad or giant ferris wheel, through the green expanse of Prater Park. It then continues on Vienna's Ring Road, past the famous Opera House, through Vienna's River Valley to reach Schönbrunn Castle, the former imperial summer residence. On the way back runners can take in the greatest examples of Vienna's architecture along the Ring Road, from the numerous museums and the Town Hall to the Burg Theatre and the University. 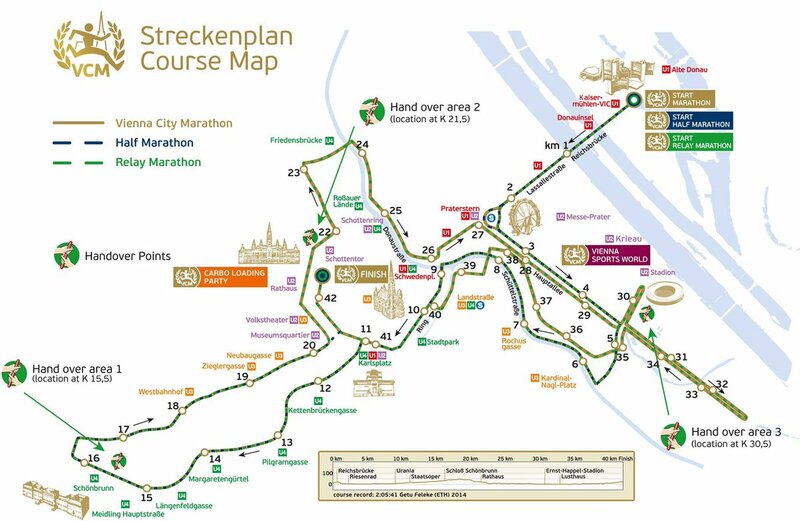 Plan your race and get information about all the details of the VCM course. You will see it is one of the most culturally impressive marathon courses in the world. The Vienna City Marathon takes you to Vienna's most impressive modern and historic sights. It starts between the skyscrapers of the UNO complex, the site of the United Nations. Straight after the start, participants cross the 864 metre long Imperial Bridge (Reichsbrücke) over the River Danube, accompanied by the world famous melody of the Danube Waltz by Johann Strauß. The race takes you past the Riesenrad or giant ferris wheel, through the green expanse of Prater Park. It then continues on Vienna's Ring Road, past the famous Opera House, through Vienna's River Valley to reach Schönbrunn Castle, the former imperial summer residence. On the way back runners can take in the greatest examples of Vienna's architecture along the Ring Road, from the numerous museums and the Town Hall and Vienna University. Finish for all races is at the "Universitätsring" directly in front of Vienna Burgtheater. Marathon, half marathon and relay marathon start on Sunday at Wagramer Straße close to the "Reichsbrücke". 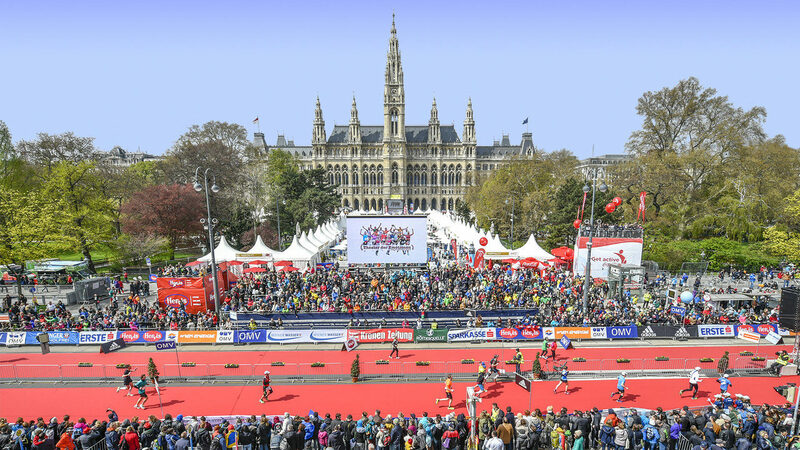 Hevis Vienna 10K and #GETMOVIN YOUTH RACE start on Saturday at Prater Hauptallee close to the ferris wheel while SANLUCAR KIDS RACE gets underway at Parkring near Stadtpark.